The Commodore Barry Division #1, Gloucester County, New Jersey held the 35thannual Commemoration and wreath laying for Commodore John Barry at the bridge named for him in Logan Township,New Jersey on September 10, 2011. The annual event had a great turn out of dignitaries and division members for the Irish born, revolutionary war hero and the Father of the American Navy. New Jersey State Treasurer Sean Hughes and Gloucester County Freeholder Heather Simmons attended and said a few words. An aide from Senator Menendez’s office read a letter from the Senator. 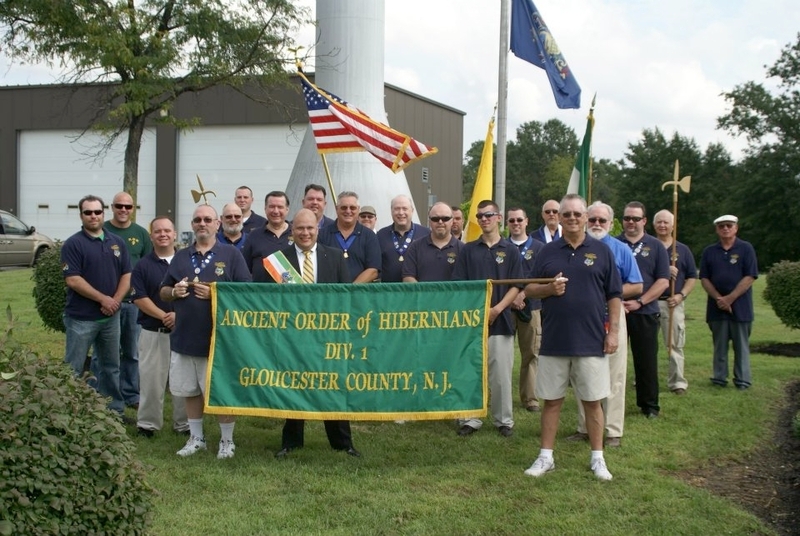 Also, many AOH members and officers from a number of divisions in New Jersey and Pennsylvania joined in the festivities. At the ceremony a new Barry Memorial garden was unveiled which was funded by donations from the New Jersey State Board and Mr. Ron Jones in memory of his wife. At the conclusion of the ceremony everyone returned to the Commodore Barry AOH Hall for mass, celebrated by our chaplain, Fr. Ken Hallahan, followed by refreshments and entertainment from the Broken Shillelaghs.